Come to Manor College to view the solar eclipse on Monday, August 21st between 12 – 5pm! Make your own pair of solar viewers, enjoy tasty space-themed snacks and (most importantly) save your seat for the Fall 2017 semester by submitting your $50 deposit (a 50% savings)! Admissions counselors will be available between 12 – 5pm to answer and assist accepted students with any enrollment related questions. New and incoming students can also take their placement tests and register for the Fall semester classes they need. Take your first step to becoming #ManorBound. 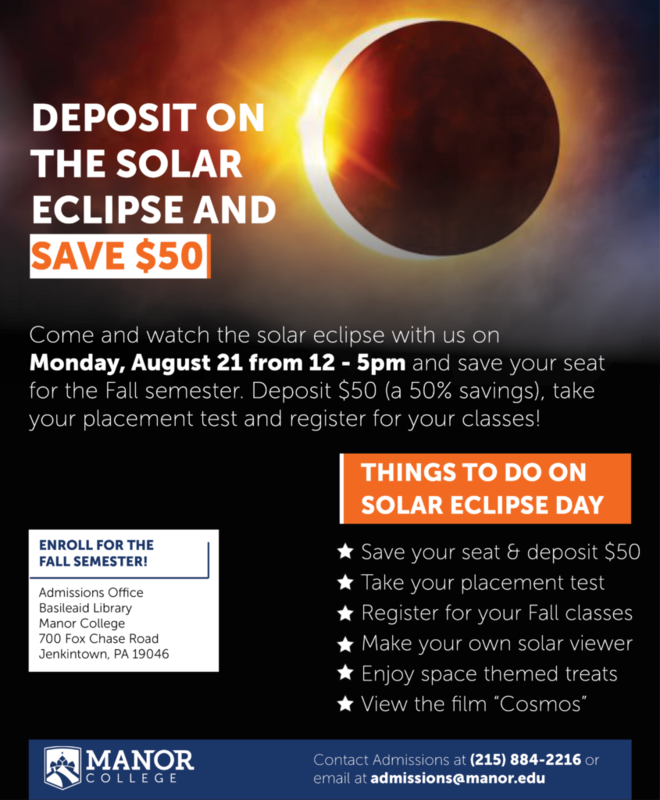 If you have not been admitted to Manor College, we encourage you to submit your application and bring all required documents to campus on solar eclipse day to receive an Instant Admissions Decision.